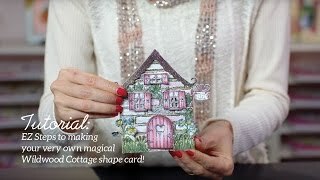 A whimsical fairy garden brings out the childlike imagination in all of us, and adding these adorable darling pixies to your garden themed paper crafts will gladden the hearts of those who receive them. Pair with the coordinating cling stamps to create adorable embellishments to add to cards, scrapbook layouts and even mixed media projects! Build upon magical fairy settings using the adorable mushroom and potted plant embellishments! These dies are part of the Wildwood Cottage Collection and pair with the Wildwood Cottage Darlings Cling Stamp Set.